I give The Leftovers Season 2 three stars out of five. If it weren’t for the Sudden Departure, it would have four, but until they tell us where it went, you’re stuck with three! Are You In Need of Some BBQ Leftovers? Head to Miracle! When it comes to watching television series, do you know what drives a person totally crazy? The Leftovers!!! Holy cow! I can't even explain exactly why I am still watching this series, which just released Season 2 on Blu-ray and DVD. Each episode is guaranteed to give you more questions than answers and makes you question everything you thought you knew at the same time. Now, season one basically gave you the founding premise that 3 years before Episode 1, there was a global event called the "Sudden Departure" where 2% of the worlds population just up and disappeared. No reason given. Some speculated it was the Rapture, some aliens, pretty much every possible reason why people could just up and disappear came to mind and, nope, it still hasn't been explained! Spawning from this event is a cult that was formed called The Guilty Remnant who always wore white, chain-smoked and took a vow of silence, along with a fascination of writing on paper with thick Sharpie markers (I know! Great product placement there!). In this cult, is our main character, Kevin Garvey's wife, Laurie, who is struggling with losing her unborn baby girl, and Patti, who's pretty much the leader of the local division of the cult. Basically, the whole first season revolves around Kevin and Laurie's family and how they, and the town, have dealt with the Sudden Departure and those they lost. It was more or less a survivor's guilt therapy session. Season two starts off with Kevin and his newly formed family, which consists of him, his daughter, Nora, who became close to Kevin at the end of season one, and the baby they found on their front porch, heading to Miracle National Park in Jarden Texas. Now, the big deal about Miracle is the whole population of 9,261 survived the "Sudden Departure", making it a pilgrimage destination for many people seeking answers. But in Miracle, there seems to be more questions than answers! Shocking, huh? Nora's brother, who is a Pastor from season one, moved to Miracle, which gave Nora the bright idea to move too. Unknown to Nora and Kevin, the house they rented in Miracle was burnt down, and by sheer luck, one was up for auction and for a mere $3 million, they won their very own money pit! For Nora, who lost her whole family in season one, no price was too high to be able to feel safe again, knowing no one departed from these city limits. Miracle sounds like the ideal place to live, but even Eden had snakes! Once in their new home, Kevin and family get invited to the neighbor's "Birthday party" which is really more a ploy by John Murphy (Played by Kevin Carroll) to question their intentions in his town. John isn't exactly the most trusting person and has a tendency to feel he has the right to be the swift hand of justice to those who bear false witness. John's wife, Erika (played by Regina King from American Crime & Ray), welcomes the Murphy's in to meet their two children, Michael & Evangeline, over some BBQ and afterwards, Evangeline goes out with her girlfriends. All the while, on a side story, we get to see that Kevin's x-wife Laurie has left the Guilty Remnant and now is trying to save others within the cult by having her son bring them out to therapy sessions and try to make them feel that life is worth while again. And then, the earth shakes! And the rules change. Kevin wakes up in the river bed at the local springs, which seems to be magically drained dry (except for the poor fish flapping around in puddles), and he's alone with a rope tied from his leg to a cinderblock. Yup. The only one there talking to him is the ghost of Patti (the x-leader of the Guilty Remnant who SPOILER ALERT dies at the end of season one) and she is even more annoying now that she's actually talking and not writing on a pad with a sharpie marker! Kevin also finds a car parked by the riverbed which belonged to one of the girls that John Murphy's daughter, Evangeline, went out with after the BBQ. Doors locked, music playing, cell phones inside and it looks as if they might have…. suddenly departed? What became of the girls? How did Kevin wake up with a cinderblock attached to his leg? Where'd the water from the springs go? Is Kevin's neighbor a complete loose cannon? What's with the earthquakes? What the hell is going on? This is the Leftovers! Watch and you may find out……or not! HBO's The Leftovers Season 2 is out now on Blu-ray, DVD, and Digital HD. The set is 2 discs with no extra content asside from the show episodes. Oh, and if your curious about Miracle National Park in Jarden Texas, it's actually the town of Lockhart, Texas. While I was doing research, and, of course, had to look it up to see where this fictional town is, I found out that Lockhart was used in the films "What's Eating Gilbert Grape" and "Where The Heart Is", and, more importantly, in 1999 the Texas legislature proclaimed Lockhart to be the "Barbecue Capital of Texas". So, if you're up for a visit, get your self some BBQ. I'm betting your gonna walk away with some Leftovers! Leftovers Season 2 is consistently frustrating and keeps you guessing, but, oddly enough, keeps you coming back over and over again if only to see if you can figure out what the hell is going on! I give The Leftovers Season 2 three stars out of five. If it weren't for the Sudden Departure, it would have four, but until they tell us where it went, you're stuck with three! 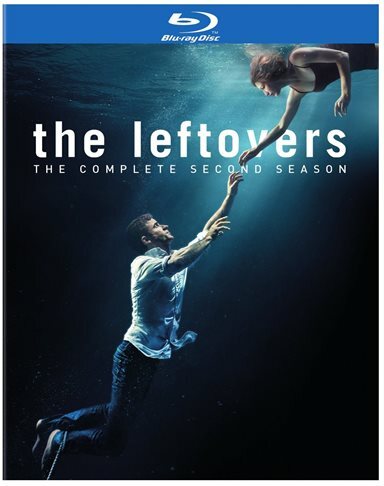 Download The Leftovers: The Complete Second Season from the iTunes Store in Digial HD. For more information about The Leftovers visit the FlickDirect Movie Database.